Following her graduation from Soldan High School in 1937, Jones landed her first professional acting and dancing jobs at the St. Louis Municipal Opera Theatre (more commonly known as The Muny) and in an act with six other girls at the Hotel Jefferson. Impressed with her ability, performer Andy Mayo, recruited her to appear in his act "Morton and Mayo". Jones toured the American vaudeville circuit for three years, serving as ringmaster and comedic foil for "Pansy the Horse", as Mayo and his partner, Nonnie Morton, performed in a horse suit. They appeared together in some short films. In 1941 Jones, now known by the stage name Virginia Mayo, got another career break as she appeared on Broadway with Eddie Cantor in Banjo Eyes. In the early 1940s, Virginia Mayo's talent and striking beauty came to the attention of movie mogul Samuel Goldwyn, who signed her to an acting contract with his company. Goldwyn only made a few films a year and would usually loan out the actors he had under contract to other producers. Her first notable role was in Jack London (1943), which starred her future husband Michael O'Shea for producer Samuel Bronston. Goldwyn gave her a bit part in Up in Arms (1944) then RKO borrowed her for a support role in a musical, Seven Days Ashore (1944). Mayo's first starring role came in 1944 opposite comedian Bob Hope in The Princess and the Pirate (1944), a spoof of pirate movies made by Goldwyn. It earned over $3 million at the box office. Goldwyn then made her Danny Kaye's leading lady for some musicals, Wonder Man (1945) and The Kid from Brooklyn (1946), both very popular. Going against previous stereotype, Mayo accepted the supporting role of unsympathetic, gold-digger Marie Derry in William Wyler's drama The Best Years of Our Lives (1946) for Goldwyn. Her performance drew favorable reviews from critics, as the film also became the highest-grossing film inside the US since Gone with the Wind. At the zenith of her career, Mayo was seen as the quintessential voluptuous Hollywood beauty. It was said that she "looked like a pinup painting come to life". According to widely published reports from the late 1940s, the Sultan of Morocco declared her beauty to be "tangible proof of the existence of God." Eagle Lion Films borrowed her to play the lead in Out of the Blue (1947), a comedy with George Brent. Mayo was reunited with Kaye in The Secret Life of Walter Mitty (1947), another big success, and A Song is Born (1948), a box office disappointment. In between, Warners borrowed her for the lead in a film noir, Smart Girls Don't Talk (1948). Warner Bros ended up taking over her contract from Goldwyn. They starred her in another film noir, Flaxy Martin (1949) with Zachary Scott, then she did a Western with Joel McCrea and director Raoul Walsh, Colorado Territory (1949), and a comedy with Ronald Reagan, The Girl from Jones Beach (1949). 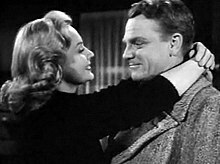 Mayo received excellent reviews in another unsympathetic role, playing Jimmy Cagney's girl friend in White Heat (1949), also for Walsh. Mayo admitted she was frightened by Cagney as the psychotic gunman in White Heat because he was so realistic. Roy Del Ruth borrowed her to play opposite George Raft in Red Light (1949) and she was Milton Berle's leading lady in Always Leave Them Laughing (1949). Mayo was top billed in the film noir Backfire (1950) and she was in a huge hit in The Flame and the Arrow (1950) as Burt Lancaster's love interest. She co-starred again with James Cagney and a young Doris Day in The West Point Story (1950), singing and dancing with Cagney, and was Gregory Peck's leading lady in Captain Horatio Hornblower R.N. (1951), Warners most popular film of the year. She co-starred with Kirk Douglas in a Western for Walsh, Along the Great Divide (1951). Mayo starred opposite Dennis Morgan in David Butler's Technicolor musical, Painting the Clouds with Sunshine (1951) which was a moderate success. While Mayo appeared in several musicals, using her training in dance, her voice was always dubbed. Mayo appeared in the all-star cast of Starlift (1951) and was top billed in She's Working Her Way Through College (1952) with Reagan. She was Alan Ladd's leading lady in The Iron Mistress (1952), a popular biopic of Jim Bowie, and starred in another musical, She's Back on Broadway (1953). Mayo appeared in the comedy-drama-action film South Sea Woman (1953) with Burt Lancaster and Chuck Connors. RKO borrowed her for a Western in 3-D, Devil's Canyon (1953), and she co-starred with Rex Harrison and George Sanders in King Richard and the Crusaders (1954). She was top billed in The Silver Chalice (1954) opposite Pier Angeli and Paul Newman in his film debut. The film was a notorious flop. Benedict Bogeaus gave her the lead in Pearl of the South Pacific (1955). Edmund Grainger cast her in Great Day in the Morning (1956) with Robert Stack. Mayo went to 20th Century Fox to play Robert Ryan's leading lady in The Proud Ones (1956) then she did Congo Crossing (1956) at Universal. Mayo was reunited with Ladd in The Big Land (1957) made back at Warners. She played Cleopatra in the 1957 fantasy film The Story of Mankind with Vincent Price, Hedy Lamarr, Cesar Romero, Agnes Moorehead, and the Marx Brothers. Mayo did The Tall Stranger (1957) with McCrea for Allied Artists, Fort Dobbs (1958) with Clint Walker at Warners and Westbound (1959) with Randolph Scott at Warners. Her last film of the decade was 1959's Jet Over the Atlantic with Guy Madison and George Raft. Mayo also began guest starring on television shows such as Conflict, Wagon Train, The Loretta Young Show, and Lux Playhouse. Mayo and her husband made a pilot for a TV series McGarry and His Mouse (1960), which was not picked up. She went to Italy to make Revolt of the Mercenaries (1961). Mayo's film career tapered off considerably. She appeared in Young Fury (1965) with Rory Calhoun, Castle of Evil (1966), and Fort Utah (1967) with John Ireland. She also guest starred on shows such as Burke's Law, Daktari and The Outsider and appeared on stage in shows like That Certain Girl (1967) and Barefoot in the Park (1968). Mayo continued to act on stage for the rest of her career, mostly in dinner theatre and touring shows. Productions included No, No Nanette (1972), 40 Carats (1975), Good News (1977), Move Over Mrs Markham (1980) and Butterflies Are Free (1981). Mayo continued to occasionally appear on television in shows such as Police Story, Night Gallery, The Love Boat, Remington Steele, and Murder, She Wrote, and a dozen episodes of the soap opera Santa Barbara. Mayo was in Fugitive Lovers (1975) and was one of several stars to make a cameo appearance in the all-star box office bomb Won Ton Ton, the Dog Who Saved Hollywood (1976). She had roles in Lanigan's Rabbi (1977), Haunted (1977), and French Quarter (1978). Her later appearances were in Evil Spirits (1990), Midnight Witness (1993) and The Man Next Door (1997). Mayo was one of the first to be awarded a star on the Hollywood Walk of Fame. Hers is located at 1751 Vine Street. In 1996, Mayo was honored by her hometown as she received a star on the St. Louis Walk of Fame. In 1993, Mayo published a Christmas themed children's book entitled, Don't Forget Me, Santa Claus through Barrons Juveniles Publishers. Mayo wed Michael O'Shea in 1947, and they remained married until his death in 1973. The couple had one child, Mary Catherine O'Shea (born 1953). The family lived for several decades in Thousand Oaks, California. In later years she developed a passion for painting and also occupied her time doting on her three grandsons. She converted to Roman Catholicism by way of Archbishop Fulton J. Sheen. A lifelong Republican, she endorsed Richard Nixon in 1968 and 1972, and longtime friend Ronald Reagan in 1980. Mayo died of pneumonia and complications of congestive heart failure in Los Angeles on January 17, 2005, aged 84, at a nursing home in Thousand Oaks. Her death was reported the next day in the New York Times. She is buried next to her husband in Pierce Brothers Valley Oaks Park in Westlake Village, California. ^ a b c d e f g Brown, John W. (2008). Missouri Legends: Famous people from the Show-Me State. St Louis: Reedy Press. pp. 168, 169. ^ a b c "Virginia Mayo bio". Turner Classic Movies website. 2013. Retrieved 5 October 2013. ^ a b c d e "About Virginia Mayo". Official Mayo website maintained by her estate. 2013. Retrieved 5 October 2013. ^ "Stage Horseplay on Broadway". The Hutchinson Kansas News-Herald. February 1, 1942. p. 5. Retrieved November 28, 2015 – via Newspapers.com. ^ "Banjo Eyes | IBDB: The official source for Broadway Information IBDB: The official source for Broadway Information". IBDB. Retrieved 2015-09-19. ^ Variety (13 February 2018). "Variety (January 1945)". New York, NY: Variety Publishing Company – via Internet Archive. ^ Martin, William Patrick (15 October 2015). "Wonderfully Wordless: The 500 Most Recommended Graphic Novels and Picture Books". Rowman & Littlefield – via Google Books. ^ "Fulton J. Sheen: Life is Worth Living". 9 December 2016. ^ Mayo, Virginia. Virginia Mayo: The Best Years of My Life (2002), pp. 194–95. ^ Severo, Richard (January 18, 2005). "Virginia Mayo, Movie Actress, Dies at 84". The New York Times. ^ "Find-A-Grave Virginia Mayo". Find A Grave.com. 2013. Retrieved 5 October 2013. ^ Wilson, Scott (19 August 2016). "Resting Places: The Burial Sites of More Than 14,000 Famous Persons, 3d ed". McFarland – via Google Books. Wikimedia Commons has media related to Virginia Mayo.